Rep McDermott On White House Secrecy, Kerry’s Lean to the Right and Why Rumsfeld Should Resign | Democracy Now! Calls increased Thursday for Defense Secretary Donald Rumsfeld to step down for his handling of the prison abuse scandal in Iraq. Presidential candidate John Kerry, House minority leader Nancy Pelosi, Senator Tom Harkin as well as The New York Times all called for Rumsfeld to resign. Congressman Charles Rangel called for Rumsfeld’s impeachment. CNN is reporting Rumsfeld will announce today plans to form an independent panel to review how the Pentagon handling of the Iraqi prisoner scandal. The Washington Post is reporting that Bush’s advisers had urged the president to apologize on Wednesday during his interviews with the Arab language television networks, but for some reason he did not. Rep. Jim McDermott, Democratic Congressman representing the Seattle area. He was first elected in 1989. He is a psychiatrist by training. AMY GOODMAN: This is democracy now!. We’ll be back in a minute. AMY GOODMAN: That was Edwin Star, the late Edwin Star here on Democracy Now!, democracynow.org. We’re broadcasting from Seattle, and we’re joined by Seattle Congressmember, Jim McDermott. Calls increased Thursday for Defense Secretary, Donald Rumsfeld, to step down for his handling of the prison abuse scandal in Iraq. Presidential candidate, John Kerry, House Minority Leader, Nancy Pelosi, Senator Tom Harkin as well as The New York Times have all called for Rumsfeld to resign. Congressmember Charles Rangel called for Rumsfield’s impeachment. Senator Edward Kennedy of Massachusetts placed the blame, not on Rumsfeld, but on Bush. He said, quote, “The tragedy unfolding in Iraq is the direct result of a colossal failure of leadership. The President has failed the Iraqi people, and he has failed America.” Today, Rumsfeld will testify before the Senate Armed Forces Committee. One republican staff member predicted, quote, “If he says anything arrogant, it’s over.” CNN is reporting Rumsfeld will announce today plans to form an independent panel to review how the Pentagon has been handling the Iraqi prisoner scandal. Meanwhile, President Bush once again defended Donald Rumsfeld. GEORGE W. BUSH: Secretary Rumsfeld is a…really good secretary of defense. Secretary Rumsfeld has served our nation well. Secretary Rumsfeld has been the secretary during two wars, and, uh, he is, uh, he is an important part of my cabinet and he’ll stay in my cabinet. AMY GOODMAN: That was President Bush speaking yesterday at the Rose Garden next to King Abdullah of Jordan. The Washington Post is reporting that Bush’s advisers had urged the President to apologize on Wednesday during his interviews with the Arab language television networks, but for some reason he did not. We’re joined right now by Seattle congress member, Dr. Jim McDermott. Welcome to Democracy Now!. REP. JIM MCDERMOTT: Hi. Good to be here. AMY GOODMAN: It’s good to have you with us. What are you calling for? REP. JIM MCDERMOTT: I think Rumsfeld should have gone a long time ago, but the President, if nothing, is loyal. He sticks with a loser, and I think he has had bad advice. If you look at the history of this, all of this was predicted by a study done by the State Department way back when. Generals told him he would need 300,000 people. Over and over again his arrogance and hubris, really, has gotten him in serious difficulty, and I think it’s time to go. The President is not well served by this man. 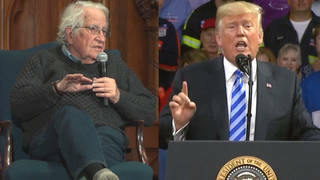 AMY GOODMAN: Now, Senator Kennedy is placing the blame on Bush, saying the tragedy unfolding is a direct — he says it’s a colossal failure of his leadership. REP. JIM MCDERMOTT: When the Bay of Pigs happened, John Kennedy said, the buck stops at my desk. And when the things that went on in other events, you had people who stepped forward and said, “It’s my responsibility.” This president simply never does anything wrong. And I think Senator Kennedy is absolutely right. He is really the cause. We didn’t get into it — we’re not going to get him to resign, but I think he can change his team. If they don’t change the team, they won’t change the approach they’re using towards Iraq, which has been disastrous. AMY GOODMAN: Now you’ve got people like Nancy Pelosi calling for the resignation of Donald Rumsfeld, but then New York congress member Charles Rangel is calling for his impeachment. It might surprise some that a Defense Secretary could be impeached. What’s the difference? REP. JIM MCDERMOTT: I think that the problem is that we all know that President Bush is not going to remove him. He’s not going to quit. AMY GOODMAN: You don’t think he would be the fall guy? REP. JIM MCDERMOTT: No. No. They will never admit they made a mistake. I think that that’s — I mean, that’s why the President went out there, and had to be taken out into the rose garden twice before he could finally say, I’m sorry for what happened. He never said he was sorry to Muslims. He said I’m sorry to the families of those people who were mistreated. But — a much larger apology was necessary for anybody to believe him. So I think Charlie Rangel is just dealing with reality when he says that — we’re going to have to wind up having to impeach this guy. AMY GOODMAN: You can impeach a defense secretary, not just a president? REP. JIM MCDERMOTT: Yes. You can impeach a federal official who is malfeasant in office. And this is a man who did not provide the training. He did not provide the equipment. He did not provide the planning for making this a success. Everyone knew we were going to win the war, the war part of this. It was after the fighting stopped, after the mission was accomplished, so to speak, that we knew there was a problem. And it turned out that they just ignored everything. AMY GOODMAN: Seymour Hersh’s piece, the Pulitzer Prize winning reporter who won the award for his reporting now has a huge exposé in the New Yorker Magazine, the story of the abuse of the prisoners at Abu Ghraib. Clearly the US government knew exactly what was going on months ago, and Donald Rumsfeld did tell President Bush. It didn’t stop with Donald Rumsfeld knowing, even though you have this unusual rebuke by Bush of Rumsfeld. He said, and I think the reference was something like — the question was whether he had seen the pictures, or had seen more about these pictures being released to the American public. That has been what has clinched this. The US government could have denied it until the pictures. REP. JIM MCDERMOTT: Right. The issue here is — John Dean wrote a book called Worse than Watergate. He talks about this is the most secretive government we have ever had. They try to kill everything by making it secret, keeping it away from the American people. The problem in a democracy, as long as you have a democracy, we are going to find out what’s happening. The president still believes that you can keep this secret. We have the Chief of Staff, General Myers, saying, “I haven’t read the report.” Now, here we have pictures that people are saying have ended our ability to win the war. And a Chief of Staff of the United States military has not taken the time to sit and read the report. AMY GOODMAN: Now, according to Hersh, and I mean — you have the military now going after the individuals, these pictures of these young women and men who are standing with these grotesque pictures of the Iraqi prisoners being sexually molested, dead prisoners together with live prisoners, men with bags over their heads. He says that the main point is that this is all about military intelligence, exactly how things were being run by the military, not just a few individuals, who will probably be scapegoated. And then you’ve got military intelligence, part of the Pentagon, and you have the private contractors that are involved in interrogations. REP. JIM MCDERMOTT: Now, my feeling on that is this: I was a psychiatrist in the Vietnam war, and I saw people do — I heard from people about what they really did. I was in Los Angeles dealing with them as they came back when they were really upset by what they had done. I think that we’re clearly going to deal with the people who did the actual acts, but that will be a terrible travesty if we stop anywhere short of way up the line. These people were being directed by military intelligence, and it’s pretty clear they were being directed by former intelligence people who are now in these private armies, who are under no rules, no regulations, no American law, no anything. The only thing they have a responsibility to is the company for which they work. Now, that should not be a function that we have privatized. It’s one of — it’s another one of Rumsfeld’s mistakes. He is privatizing everything under the sun that he can get out. The only thing he is left with the soldiers doing is carrying rifles and shooting bullets. He’s trying to privatize it all. You get into this kind of a thing because you have no control. You have no responsibility. You have no oversight. It really is — it absolutely demands as wide investigation. AMY GOODMAN: But you have deniability once you have military companies. REP. JIM MCDERMOTT: Yes, of course, that’s the reason. You hire the people, you give them the contract, and say, “Hey, go out there and find out the intelligence.” After that, you have plausible deniability. You can say at any time, “I didn’t know they were doing that. Oh my goodness, no, no, no.” You can be just so disingenuous in that situation because you’ve put this barrier between yourself and the responsibility to know, and the responsibility to be accountable to the Congress and the American people. AMY GOODMAN: Can you explain this? We read in the headlines about the government’s chief classifier beginning investigating whether the Pentagon illegally classified its internal study on prison conditions. The law bars government agencies from classifying reports in order to conceal illegal or criminal activity. The Pentagon has yet to explain why the report, which was eventually leaked to Seymour Hersh, was classified. REP. JIM MCDERMOTT: As I said earlier, the secrecy is a very slippery slide in a democracy. When you start stamping secrecy on things. When I was in the Navy, they stamped secret on the menu for the admiral’s lunch. I mean, they can put secret on anything and then you can’t let it out. What is implied by this is that you cannot use secrecy to deny the public access to criminal acts. Knowledge of criminal acts. I think there’s probably some legal action that can be taken about that. I don’t know those facts well enough, because I’m not a lawyer, but having been in the military, I know that they try to hide everything by stamping secret on it. AMY GOODMAN: We’re talking to congress member, Jim McDermott. We are broadcasting from Seattle, where tonight we will be honoring and celebrating KBCS Community Radio. Also a shout out to SCAN, Seattle Community Access Network, which also broadcasts Democracy Now! As we broadcast on more than 220 radio and television stations around the country as well as Free Speech TV, that we just came from yesterday, in Boulder, Colorado. That’s on Dish Network. I want to talk about John Kerry today. As we were flying in, I heard he was on the radio here in Seattle. But what about John Kerry’s stance? I’m looking at your statement before the invasion. It was unusual in congress. Then you do have people like Congress Member, Barbara Lee who came out against all war after September 11. But your statement before the invasion, “My prayers are with the troops and the Iraqi people, that our troops will return home safely and the deaths of innocent Iraqi children and other civilians will be avoided. I do not agree with the path that Bush has chosen. This war was avoidable. I feel bi-passing the United Nations and demanding regime change by force, instead of working towards peaceful disarmament, is a dangerous step for our nation. An important difference between our country and Iraq is that we can and do speak out. Americans should continue to exercise their constitutional right to express their beliefs. The legacies of war remain with us forever. We now owe the Iraqi people the fulfillment of the promises our president has made to them.” That’s very important from senator John Kerry, the presumptive democratic nominee. He supported the invasion, as did John Edwards. Your comments as you support John Kerry for president. AMY GOODMAN: But there were congressmembers and senators who did not believe the evidence, and many outside — many people in the intelligence community were saying the intelligence has been manipulated and misrepresented, were saying then, that Bush lied. You came to the conclusion that President Bush should not be invading Iraq. But John Kerry, in assessing the information, fell for the lie. Why? REP. JIM MCDERMOTT: I cannot answer for him. I wish that he had said that he was against the war. It would be a whole lot easier for me to support him, but I — there’s no question that he’s better than Bush on 100,000 levels. AMY GOODMAN: Well, now he’s calling for more troops to be sent to Iraq. I’m wondering what you think the Democratic National Convention is going to look like. I have been thinking a lot about 1968, and what it looked like outside in the streets in Chicago. Inside, Hubert Humphrey was being nominated. You had a situation where the democrats were supporting war, were getting more deeply involved. And the people weren’t standing for it. Well, how is that different now? Kerry is calling for more troops in Iraq. REP. JIM MCDERMOTT: I think that what he’s saying, if you are going to stay there, we need more troops. I think the question is whether we ought to be staying there, whether we ought to be pulling out totally, and doing what they’ve done in Fallujah. I think it’s possible, for instance, to isolate the problem. You can deal with the question in the North with the Kurds. That’s functioning alright. You can let the Shia have the South and let them have an election. You can put together something there and you can deal with — internationally deal with the Sunni triangle and what’s going on there. I think that what he’s saying, really, in my view, he’s saying that General Shinseki was right, if you are going to stay there, you have to have more troops. You cannot keep sacrificing our kids day after day after day. I disagree with him on that. I think I have a right to disagree with my candidate, but I can understand his thinking, but I think that it would be better if we started the process of pulling ourselves out. AMY GOODMAN: A lot of people are wondering where he does stand, where John Kerry does stand. When Howard Dean was beating him John Kerry started to — well, as Howard Dean says, give his speeches. He was maybe giving them better than Howard Dean was, when he was running against Dean. And then adopting Dean’s language. Dean loses. Now he’s running against Bush and some people are wondering if he isn’t doing the same thing, running with Bush, so that you have, for example, him supporting the assassination of the Hamas leader, supporting Bush, supporting Sharon in that, supporting in the Middle East issues Bush supporting Sharon on a number of those issues, so much so that Tim Russert on Meet the Press asked him, “You agree with him, with President Bush?” “Yes,” he says, “Completely?” and he says, “Yes.” People are wondering, here is George Bush shoring up his base, and you have John Kerry running away from his base and trying to go after the vote of President Bush’s base. REP. JIM MCDERMOTT: Believe me. There are many of us who are talking to Mr. Kerry about what he is saying. We don’t agree with many things. You never find anybody you agree with totally. And on these kinds ofissues, I will continue to exercise, and I think all of us will, our advice to him that that is not a winning strategy. AMY GOODMAN: The New York Times, a front page piece a few days ago, saying that Senator Kerry is looking for a message. Senator Kerry is looking for a theme. So many people are scratching their heads and saying, isn’t it clear? I mean, if Iraq is a defining issue, and Bush is for sending troops, why isn’t this clear what Kerry will do? How is it that he cannot define himself? REP. JIM MCDERMOTT: It’s — one of the problems when we went in was it’s a very complicated situation. If people want a simple answer, do this, do that, he will fix it. It’s not going to work that way. I — let’s take John Kerry’s plan to go to the United Nations. He says, we should get — we should internationalize this. The biggest problem there is you have to get back to the point where you can say to them, “We made a mistake, we shouldn’t have done it this way. We should —- ” that means you may have to turn over some contracts from Halliburton and from all these other countries. You have to say, yeah, the French can have some of that, and so can the Germans and so can the rest of the world. There are some things that Bush will not do, and I think John Kerry is pointing in the direction which is very difficult to go because we have put so many pieces in place already. It’s going to be very hard to turn that around. It is—-I don’t see how he’s ultimately going to get away from announcing that we are going to be out by x date and just leave the country. AMY GOODMAN: We have to break for stations to identify themselves. This is Democracy Now!. We’re talking to Seattle congress member Jim McDermott. This is Democracy Now!. Stay with us. AMY GOODMAN: Celia Cruz here on Democracy Now!, and democracynow.org. Tonight we’ll be at Seattle’s Town Hall celebrating KBCS Radio, we’ll be there with jazz musician, Bill Frisell. We’re talking to Seattle Congressmember, Jim McDermott. Congressmember McDermott, you are supporting calls for a draft. Why? REP. JIM MCDERMOTT: I’m not supporting calls for a draft. Charlie Rangel and I put in a bill to say let’s have a debate here about how we’re going to do what the President says we’re going to do. Anybody who looked at it could see there weren’t enough troops, and this country got rid of the draft. I believe we ought to have national service. I think men and women ought to serve at least a year in the service of their country, whether it’s in schools or mental hospitals, or in forests or wherever, or military. I would not vote for a draft. I would not vote for a simple military draft to expand our wild ideas around the world. But I do think there ought to be a debate. You see from Chuck Hagel that this issue is now coming on the republican side. They recognize — they were trying to hide this and get past the election and bring it up in the next term. That’s what they were really — that had to be the plan, because they do not have enough people there. They’re so thin that they’re really having serious problems now manning these posts. AMY GOODMAN: And now the Seattle Post Intelligencer, your paper here in Seattle, saying that the chief of the Selective Service System has proposed registering women for the military draft and requiring young Americans regularly inform the government about whether they have training in niche specialties needed in the armed services. REP. JIM MCDERMOTT: This is exactly what we were afraid of, that they would begin to select and look for what they wanted, and pull people in and hold them. I mean, these people have joined the National Guard and Reserves. They think they’re going to serve for a year. So they get over there, they get a message, 90 more days, that’s it. They have lives at home that they have been putting on hold. Now they’re going to get this draft started where they can reach out and select the women. “Oh, you’re a computer person — oh, we need you. You are a schoolteacher, and we don’t need you.” That’s not a democratic process. We have to look at this and have a national debate on that before they go ahead and do that. REP. JIM MCDERMOTT: I went there in August after the first war and saw all of the destruction and everything that had happened there. I had seen the hospitals and had seen the water system. I had seen the sewage in the streets. I had seen all of the problems. Recently, it was about 2000 or so, a guy in the city of Seattle, Burt Sachs, said to me, “Come on, you have to go back and see what’s going on, how bad the sanctions have been.” I said, “I know how bad they are. I don’t need to look at it.” I said, “If you can get somebody from the press to go with me, I’ll go.” So, he went around and got the local newspaper to send their foreign policy editor with us, and I was in a box. So that’s how I got over there. I did not — I didn’t have any intention of going over there. AMY GOODMAN: Well, big controversy when you were on ABC’s This Week program, the Sunday program appearing from Baghdad when you said in the interview from Baghdad, “I think the President would mislead the American people.” You seriously attacked. George Will said, “It was the most disgraceful performance abroad by an American official in my lifetime.” And Mara Liasson, on National Public Radio said, “These guys are a disgrace. Look, everybody knows, it’s politics 101, that you don’t go to an adversary country, an enemy country and badmouth the United States, its policies, and President of the United States. I mean, these guys ought to — I don’t know — resign.” She said this on one of her routine appearances on Fox, but she was the NPR Reporter. REP. JIM MCDERMOTT: Well, you gotta consider where she’s doing it. Anyway, I’m not waiting for an apology from any of those people. I said exactly that on the steps of the House Office Building in a press conference. It never got reported. Never got reported. So, when I’m there and George Stephanopoulos, I know George, and when he asks me that he has a clip all ready to play on TV of me saying that. So I figure there’s no reason not to say it. It’s an American reporter asking me about something said in America, and I’m willing to say it. AMY GOODMAN: Congressmember McDermott, John Negroponte being approved as the next ambassador to Iraq and his record in Honduras. A lot of your colleagues are supporting this confirmation. REP. JIM MCDERMOTT: It’s just more of the same Bush bunch, the Neocons have rounded up a guy who will do whatever they say, and do the kinds of things they want, as he did in Honduras. He was involved in the Iran-Contra business. I don’t think this is a guy that I particularly want as my guy running Iraq. He’s not going to have any credibility. AMY GOODMAN: I want to thank you very much for being with us, Congress Member, Jim McDermott.